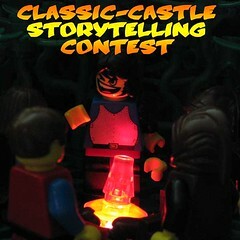 The object of this contest is to encourage the creation of castle theme stories. Subject matter may be anything within the castle theme, including historical and the fantastical. All stories must have a beginning, middle and an end. We do not want chapter one of your magnum opus! There are major points for having an interesting plot and dynamic characters, so be creative! Comic Book style is a story told primarily with pictures, with narrator boxes and dialogue bubbles to help. Each frame of the comic should be a separate picture. Sub-pictures are allowed for dramatic affect (Admins discretion will be used to figure if there are too many sub-pictures in a comic). Entries will be evaluated on their creativity in plot and character, quality of LEGO creations and quality of presentation. The judges will be the Classic-Castle Administrators and a special, Guest Judge who will be announced later. We know that writing and illustrating a story is not the easiest thing to do, so to get your attention, we’ve got big prizes! Send an email to me (lenny DOT hoffman AT gmail D0T com) with a link to your entry. The only entries that will be allowed are those that have been emailed to me! Be sure to put "Story-telling Contest" in the title of your email. The deadline to enter is September 25th and winners will be announced during the first half of October. Any questions? Ask away and I will answer as soon as I can! Last edited by Glencaer on Tue Aug 07, 2007 6:33 pm, edited 3 times in total. One question, though, regarding the formatting of a short story. What kind of spacing should entrants use? Double? Single? 1.5? Oh, and may we post our entries here after we've e-mailed them to you? Just last week I found some stories I wrote back in '03. With some revision, and some making-it-longer, and of course some MOCing, I'll have a nice entry or two. Wait, is two allowed? Great contest, Lenny! I assume that we lowly MODs can enter, like in the CCC? I also was wondering if you can enter more than once, but I don't know why I'm asking, since I will be lucky to finish one entry! eNiGMa wrote: One question, though, regarding the formatting of a short story. What kind of spacing should entrants use? Double? Single? 1.5? Double spacing. I'm guestimating there should be roughly 250 words per page, making the total word count roughly 5000 words. Yes. I'll update the official post with that fact. Two entries per category. I assume that we lowly MODs can enter, like in the CCC? Finally, a contest where I can go for the gold without horribly humilating myself with my bad MOC skills! This was a great idea Lenny, I'll enter for sure. Now time to start planning. Great idea for a contest - I'm really looking forward to the various entries. My own problem is that I'd find Lego too restricting and I'd dig out the pens, pencils, water colors, acrylics, etc., and that would kinda defeat the purpose. Crud. My summer will be spent preparing to move, moving, and settling in. 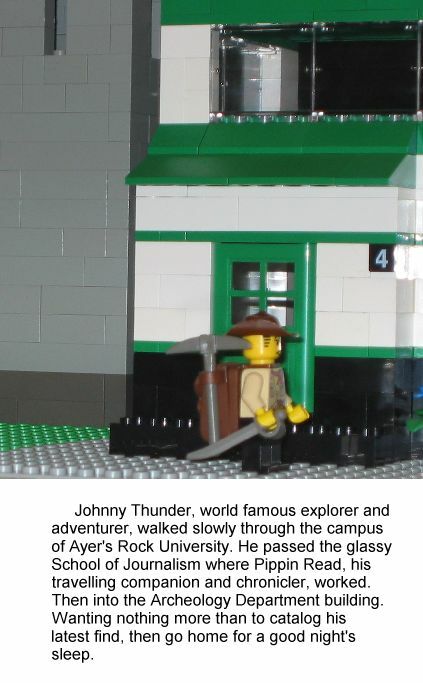 My Lego won't be easily available to illustrate anything. PS But this is a great idea. I look forward to the results. Hmm, I would love to enter this, but I'm really slow at writing, and it would probably take me two years to write 20 pages, not two months. And I don't have the pieces for illustration anyway (let alone a comic). Ohhh, well. At least it'll be fun to watch. The deadline to enter is August 25th and winners will be announced on September 1st, 2006. Wow, that doesn't really give us much time to work... at least, given my story writiing timelines. If our pics are a bit fuzzy, but the construction set is great, will we still lose marks? Does it matter what word program we use? Can we directly e-mail the stories to you? Is there a minimum lenght? Sorry about so many questions, I would just like to know, and can we have our own settings, like in our own fantasy lands? 3) Are clone brands elements (heresy! ) allowed for story's sake? That's one fantastic idea. Very kind of TLC to provide prizes - that's the least the fans deserve. One question on my behalf - should the ilustrations be strictly pictures of actual bricks or they can be drawings? I believe TTK mentioned something about pens and pencils.